[00:27:18] <owad> yes, I asked Patrick, who designed the system, and he said I should be doing at least 50 ipm for MDF, whereas I was doing 16. [00:28:18] <owad> I'm worried about these cheap 1/8" RotoZip cutters holding up, though. [00:30:17] <jmkasunich> can you change the spindle speed? [00:30:19] <owad> think that endmill can be salvaged? [00:31:16] <owad> any source you'd recommend for long 1/8" endmills? [00:31:49] <jmkasunich> you didn't answer my question - can you vary the spindle speed? [00:32:48] <owad> I'll do that. Thanks! [00:33:58] <jmkasunich> is the tooling HSS or carbide? 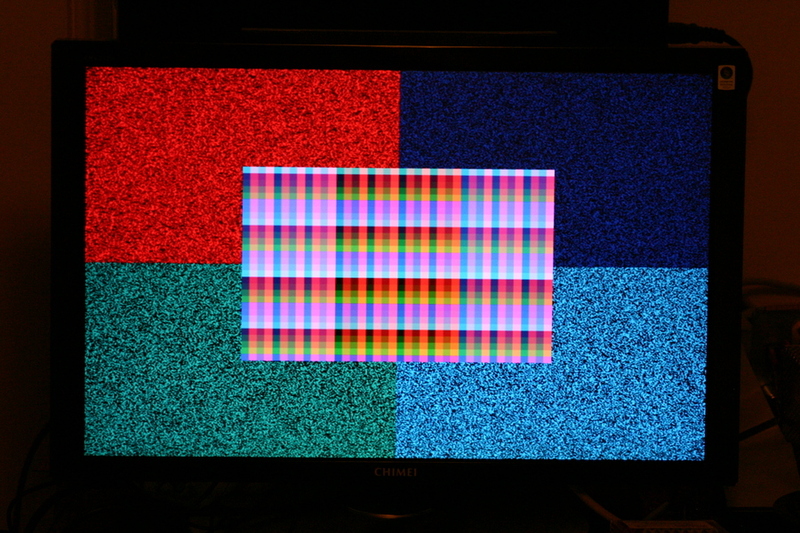 [00:36:38] <jepler> my project of the evening is 640x480x4096 colors from an FPGA: http://axis.unpy.net/files/01219715210/img_7499-medium.jpg -- the test pattern is static from an LFSR plus what should have been a grid of color swatches..
[00:37:08] <owad> say, to you use gnccam, by chance? [00:38:14] <owad> what's NCL like? [00:38:42] <owad> it can't convert dxf? [00:44:24] <stustev> where would I look to change the action of the g43 code for 5 axis work? [00:45:20] <stustev> I would like the 5 axis tool length comp that acts upon the W axis - what do you mean uh oh? [00:47:50] <SWPadnos> is that "always" or only when W is aligned with Z? [00:47:57] <jepler> so you're aware of the inifile directive [TRAJ]TOOL_LENGTH_IS_ALONG_W but it doesn't do what you want? [00:49:44] <jepler> what happens if the tool is not exactly vertical when you turn on/off g43? [00:50:47] <stustev> if it accepts it on the new control I would want it to adjust all axes involved. [00:56:02] <jmkasunich> ONLY 14", eh? [00:58:49] <jmkasunich> stustev: then what is the problem? doesn't that work for you? [00:58:52] <jepler> ok i wasn't 100% sure where you were describing the pre-emc control and where you were describing emc's present behavior ..
[01:06:11] <jmkasunich> that represents an error in the kins (pivot length or something)? [01:09:41] <jmkasunich> would that work for machines with a large (intentional) offset between spindle axis and a rotary axis? [01:32:15] <SWPadnos> are you looking at this line: "The H number in the block (if present) was checked for being a non-negative integer when it was read, so that check does not need to be repeated." [02:29:37] <CanSir> Is there a way (gcode or halui) to reset the absolute X,Y,Z position? Currently I exit EMC and then start it back up. [02:33:28] <CanSir> I don't have home or limit switches installed though. [02:40:50] <CanSir> I don't see how that helps. I start up with my machine in an unknown x,y,z so now I manually jog to the lower left corner, exit EMC and then start it back up so it knows where x=0, y=0, z=0. [02:41:30] <CanSir> Am I going about it the wrong way? [02:45:24] <CanSir> I've done too much mucking around to run stepconf on my real config. If I run into trouble though, I'll create a new 'fake' one to compare it to. [02:47:31] <CanSir> In looking over the documentation, the only other one that looks important for this application would be "Home Sequence" or "Home use Index"
[02:54:55] <stustev> cradek: how are you this evening? [03:01:19] <stustev> CanSir: if you are homing in the manner jepler described then "Home Sequence" will do nothing for you - you determine the sequence as you home each axis. "Home use index" is for when you have encoders with an index pulse. [03:24:08] <cradek> stustev: pretty decent. not much work done on the lathe today though. maybe tomorrow. [03:25:10] <stustev> what do you have to do on it? [03:25:51] <stustev> did you see my question(request) about the tool length functionality? [03:30:33] <stustev> I don't know how much work this is. I looked at the file. I don't see a way to do it. This is way beyond me (at this time). [03:31:55] <stustev> The machine is working well. The control is working well. This is not a gripe or a big need. It is something I saw while running it today. It would be a time (typing) saver when in MDI. A program can handle this without a problem. [03:32:47] <stustev> I can hardly wait to get the motion adjusted and show a video of the 5 axis motion spinning around a point with indicators in three directions. [03:33:59] <cradek> sounds neat - I look forward to seeing that video too! [03:35:16] <cradek> if there is a rotary not at zero, be careful to abort with an error so you do not end up causing a joint position jump! very important to handle that case. it could be bad. [03:57:58] <stustev> I want to update the XYZ positions if there is a rotary head not at zero. This is certainly possible. I will be able to give it some time later (after the cinci is running production). [03:58:36] <SWPadnos> can you change tools with ABC != 0? [04:01:02] <stustev> I think that will be the usual way we do it. There is no real reason to change tools at anything other than AB zero. [04:02:09] <stustev> We may want to change the offset at other than AB zero positions for blending cuts (mismatch). We use two or three offsets per tool many times. [04:05:00] <owad> jmkasunich: 40 ipm looks great when I use a good endmill. The rotozip, though, drags behind. My good 1/8" endmill only has a 1/4" cutting depth, though, and a 1/4" shank. Is it possible to affordably get 1/8" endmills that cut cut 1" deep, or will they all drag at that length? [04:07:01] <stustev> I am thinking that a 1 inch DOC with a .125 end mill is hoping for a little too much. [04:07:20] <toastydeath> i concur with the good doctor. [04:08:11] <toastydeath> a 1/8" endmill with a 1" shank is going to be a) expensive, and b) for delicate tool and die applications with very little metal removal. [04:09:04] <owad> even if I'm working with wood, not metal? [04:11:06] <owad> with the rotozip bit? [04:11:55] <toastydeath> anything you have that's 1" by 1/8"
[04:12:31] <owad> what's the shallowest cut I can take? [04:13:18] <toastydeath> start at .050" and work toward .1"
[04:16:01] <toastydeath> just write the toolpath, step it down incrementally, and let it run. [04:16:14] <owad> in the z direction, can friction be an issue if I go too shallow, like it can with the x & y? [04:16:32] <toastydeath> but i gave you your Z depth, so that won't be an issue. [04:17:44] <stustev> are you trying to contour a mold? [04:18:04] <owad> the drag is so bad with 1/8" passes, I'm concerned it will still be apparent with 0.05"
[04:18:35] <toastydeath> gantry with acme screws? [04:18:50] <stustev> the gears are laying flat on the table and you are cutting the tooth profile with the side of the cutter? [04:20:15] <stustev> the gear is 1 inch thick? This must be a mold for casting a gear. [04:20:57] <stustev> will the finished gear be MDF? [04:20:57] <toastydeath> your spindle has no speed control? [04:21:20] <toastydeath> and it caught fire at 10k? [04:21:27] <toastydeath> at 16 ipm? [04:22:56] <stustev> can you drill a hole at the root of each tooth? [04:24:39] <stustev> the plunge roughing is a good idea. You can drill a hole at the root of each tooth and then rough (normally or plunge) with a larger tool and finish with the size tool you need for the root radius. [04:25:57] <stustev> this is for show? MDF is easy to hand work. Drill the hole rough it close. Hand work it in. [04:27:29] <owad> Is there a good source for cheap endmills? There must be something better than $1 rotozips, that is still affordable. [04:28:37] <owad> so what's the cheapest endmill worth buying? [04:29:46] <owad> what do you mean, 'perfect the motion'? [04:30:40] <owad> http://www.amazon.com/4Fl-SE-Carbide-End-Mill/dp/B000I6I5NK $5 carbide? [04:32:13] <stustev> you don't want to bang corners and overload the cutter - you want to make simple clean cuts - figure that out with the rotozip cutters. A $5 carbide cutter is also a cheap tool. If your router is not pretty sturdy then you don't want to try the carbide on steel but MDF should be fine. [04:35:03] <owad> Would a Niagra or OSG be stronger? [04:36:56] <owad> Would a Niagra/OSG bend just as much as the rotozip, at 40 ipm? [04:39:14] <owad> nope. is there a part # I can look up? [04:39:53] <toastydeath> on the home page, on the left menu, click third item down "end mills, saws, cutters & tool bits"
[04:40:21] <toastydeath> click on "single end mills"
[04:40:36] <toastydeath> then it'll give you all their endmills. [04:42:47] <owad> a+ to which? [04:44:21] <owad> How do I decide how many flutes? [04:49:29] <owad> should I worry about the coating? [04:49:43] <owad> solid carbide vs carbide? [04:50:11] <owad> what's the difference make for sold vs non, and the coating? [04:52:31] <owad> Are all of MSC's brands decent? Kennametal, Accupro, Hertel, Atrax...? [04:53:00] <toastydeath> accupro, atrax? i dunno. [04:53:06] <toastydeath> i'm not sure. [04:53:33] <toastydeath> for your purposes, i would not worry overmuch. seriously. [04:58:35] <toastydeath> i'd go with kennametall for three bucks. [04:58:46] <toastydeath> but you're cutting mdf. [05:00:31] <owad> by bend, I meant drag. You don't think that'll be an issue? [05:08:57] <owad> toastydeath: last fall, I got to use a shopbot at MIT. we started out with a rotozip bit, and it dragged terribly, and then broke. Then we switched to a really pricey endmill that we weren't supposed to use, and it worked beautifully. So I really do think the rotozips are junk, but I don't know what the endmill was, or how special it was. [05:09:08] <fenn> owad: why are you using MDF to make gears anyway? [05:09:38] <owad> fenn: mdf is what I have at the moment. I'll probably use some nicer-looking wood. [05:13:45] <owad> fenn: how's gingery outdated? [05:17:20] <owad> fenn, are these updates of gingery's designs, or totally different? [05:26:43] <fenn> hmm. "While most folks are trying to get a Darwin or some other kind of reprap machine together and working, Nophead simply bought a CNC positioning table and attached a Mk II extruder to it." [05:27:02] <fenn> do they get equivalent quality out of the darwin frame? [05:27:51] <owad> I don't now about equivalent, but there are some good-looking prints from Adrian and Vik, and they're using the darwin frame. [05:29:24] <owad> Your shaper looks really nice. [05:30:15] <owad> is there a pic up? [05:30:34] <owad> is a shaper all that useful, when you have a cnc vertical mill? [05:32:52] <owad> there's always some cute Atlas shapers at the cabin fever auctions. Wish I had room for one. [05:45:25] <owad> I better get to bed. I really appreciate everybody's help. [21:28:34] <CanSir> How does the "Home" button in AXIS do it's work? I'd like to setup a pyVCP button that homes both X & Y to the current position. [21:31:55] <CanSir> The home button is AXIS works great, but I have to select the X axis, click Home, select the Y axis, click Home. I'd like to setup a single button to home both. [22:01:12] <anonimasu_> hm.. can you home Z then home X and Y togther? [22:09:04] <cradek> the only rule in irc is to not ask to ask -- just ask! [22:09:38] <cradek> what's your project? [22:10:45] <rich__> just building mini cnc router and saw that Linux cnc was available.. so guess what.. not only take the plunge from Microshaft to linux but cnc too! [22:11:31] <rich__> Been years since did IRC too I add.. bit rusty!! [22:17:26] <rich__> still error. ending line is "Module rtai hal does not exist"
[22:17:48] <cradek> how did you install emc? [22:18:23] <cradek> the cd from linuxcnc.org? [22:20:48] <cradek> when you install that way, you end up with a choice of realtime and non-realtime kernels. [22:21:54] <rich__> u mean order the real hard copy? [22:23:04] <cradek> but it sounds like all you have to do is reboot and pick the rtai kernel from the list.